I didn't intend to review this set but I plum ran out of other options. Like I mentioned a few weeks ago, I'm kind of tired of the roadside stand theme that the Friends line seems to have going on. But it's either take a look at this set or leave you with nothing to start your Monday morning with. And I know how much you love my blog. Yes, I'm looking at, my one precious reader. I hit Wally World looking for anything anything anything unique. Actually, there was supposed to be a summer LEGO clearance going on but that was a bust. And by bust I mean zilch on clearance. But they run those regionally and store by store anyway. That's what I get for believing everything I read on a website frequented by people across the globe. "Wal*Mart in India is having a sale on hamburger!" So what happens? We rush to our local New Jersey or Arizona store and get disappointed. You want impressions, not filler. Okay then, let's go. Much like my Dag Bricks, you can almost build this set just by looking at the picture. So I gave it a whirl. I was immediately sidetracked on dumping out the contents. Here was a set with exactly three Friendsy pieces. A 2x4 medium lavender plate and a pair of 2x1 45° slopes in medium azure. Everything else could have come in a Lord of the Rings, Castle, or Architecture set. It was beautiful. 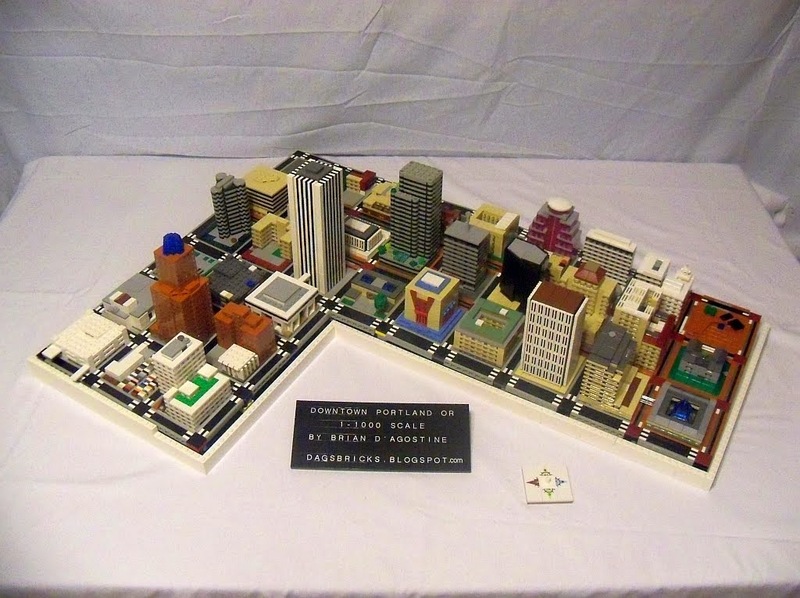 There were a couple of basic tan pieces, a white 1x1 brick with side stud, and a few other basic plates in generic colors. Lovely. But wait, there's more. TLG is very generous with their extras, though this time no extra telescope. Instead we get one each of the unique 1x1 round plates of which there are seven. On top of that, the grass/flower stems always seem to be extras as well. This means that the dismal supply of plants on the package art can be expanded to hold quite the selection of floral merchandise. Bonus for Emma! "I said no pictures. Now scram!" The other bonus for Emma is the printing on her shirt. The collar is printed asymmetrically which means there's a fashion statement being made. I haven't really taken the time to notice what any of the other mini-dolls are wearing (which would be creepy, right?) but this one caught my attention. I don't know much about fashion myself, sticking to cargo shorts and a white T-shirt. 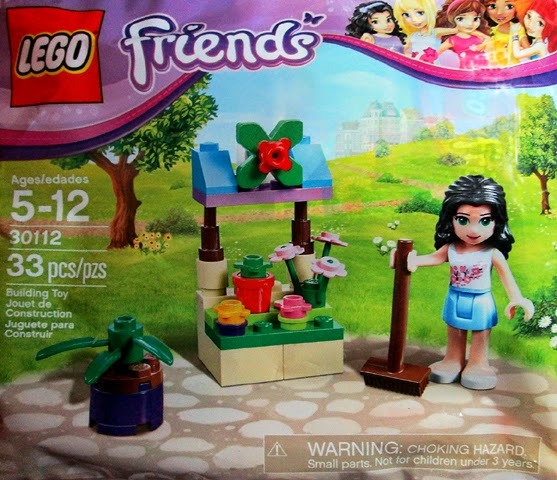 This set was found for $3.99 and contains 33 pieces (according to the bag). This translates to 29 pieces plus a mini doll. But with all those extras I was telling you about, the actual piece count jumps to 37 plus a fig. So that really nails the dime per part nirvana if you count the extras. I know I often say to buy multiples of a given set because of a particular piece but I mean it this time. 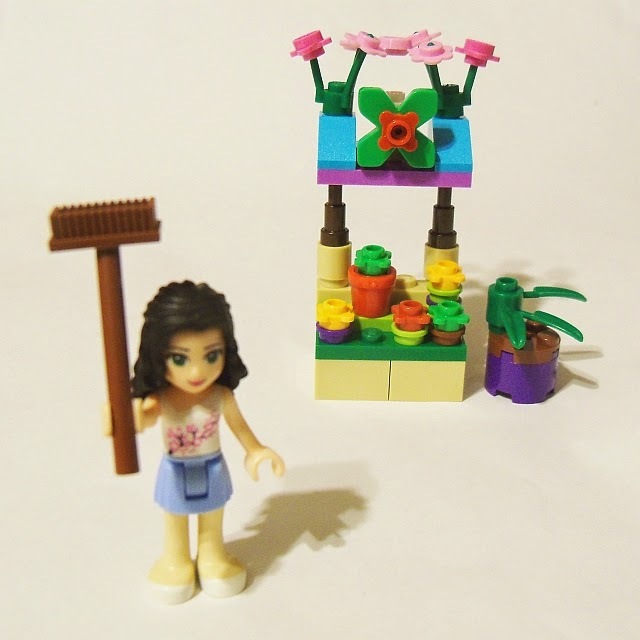 The tan bricks are always handy and the floral count is good accounting for a solid one-third of all the pieces. Dunno what you'd do with all the extra Emmas though. Plant them in your garden?